A small size manicure set with a beautiful black leather casing. Has 4 beauty metal implements inside. 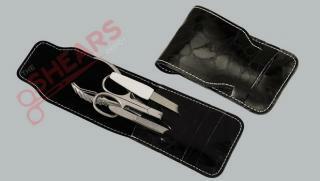 Its small size makes it very easy to carry the manicure set in a purse or a clutch. An ideal Gift product.